Born 5th November 1849, Edward ('Ted') Robert Hughes grew up to model for Dante Gabriel Rossetti (he was one of the models for Love in the replica of Dante's Dream) and Simeon Solomon (who described him as 'the beautiful Hughes' in a letter to a friend) and probably used him in And Then I knew my Soul Stood Before Me (1871) with Johnston Forbes-Robertson (who replaced him as Love in Rossetti's painting). 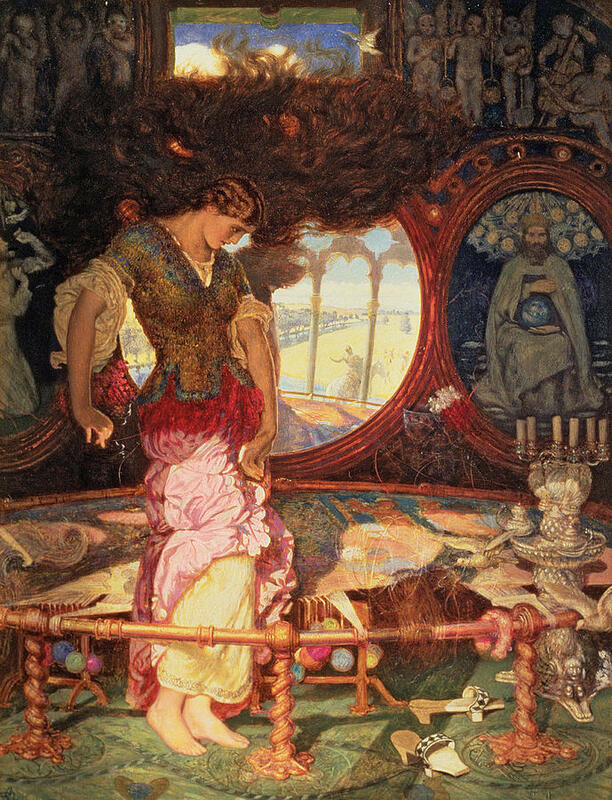 However, being a pretty face will only get you so far, and Hughes worked for over 15 years as studio assistant to William Holman Hunt, at the end of the Pre-Raphaelite Brother's life when his eyesight was failing. Hughes assisted in the completion of the massive Lady of Shalott and some attributed the colour palate to him. Hughes' work was likened to Hunt's in the press at the time which is interesting as it isn't the most immediate comparison we would make now. Thinking about it, there is definitely a link to be made between the ghostly children in Hunt's Triumph of the Innocents and Hughes' Night and her Train of Stars. Back to Hughes, and it is easy to see why this is a beautiful exhibition, but it is harder to see why Hughes is not better known. His work is very commercial - one recent review referred to him as a greetings card artist, which is true but infers commercial equals rubbish. Hughes talent seems to be to find the soul-squeezingly gorgeous in everything and put it in front of you so you have no choice to respond. 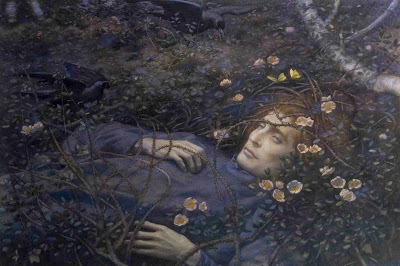 It's easy to find the Symbolist-like lady with the swirly hair attractive, but how about a rotting corpse in a ditch? 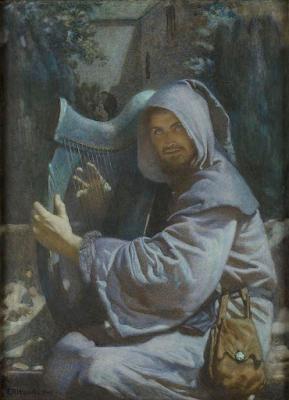 Although I can see that technically it is a very skilled piece, I am not a fan of 'creepy harp-Jesus'. It refers to the minstrel Blondel's quest to find Richard the Lionheart (but also reminds me of a still from a 1960s sword and sandal epic). The blue of Blondel's eyes is so piercing it is really quite disturbing and provides a neat counterpoint to some of Hughes' more 'comfortable' art. If you know anything by Hughes, it is likely to be one of his blue fairy pictures, painted just prior to the First World War. The powdery watercolours do nothing to dispel the feeling that Edwardian England was a sort of wonderland before the great reckoning of 1914-1918. 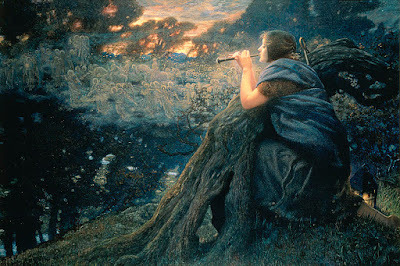 In their turn it could be argued that pictures such as Twilight Fantasy have inadvertently 'cheapened' Hughes' currency by being so accessible that they have adorned popular greetings cards and become the byword for frivolous Victorian folly. Taken together as a set, the blue fairy fantasies are all at once beautiful, mysterious and a little threatening at times but always breath-taking. As there are light-infused angels and spirits to welcome the day, so too are there darker winged creatures waiting in the shadows. 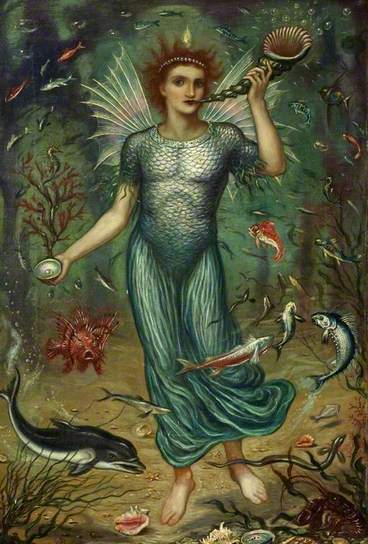 Enchanted Dreams is a very easy exhibition to enjoy because E R Hughes' work is so very luscious, however the story of his life is equally as interesting. It is hard to see how and why we forgot him in the great resurrection of the Pre-Raphaelites but his watercolours have such power that they refused oblivion. This is a fabulous opportunity to go and revel in their tender power on a grand scale, and one I would urge you not to miss. 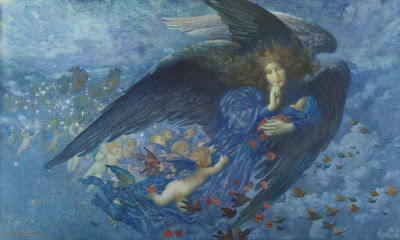 Enchanted Dreams: The Pre-Raphaelite Art of E R Hughes is on at Birmingham Museum and Art Gallery until 21st February. There is sadly no catalogue for the exhibition, but you can read Victoria Osborne's thesis on Hughes online here. On the strength of it, I hope she gets the time and funding to write a catalogue in the near future. 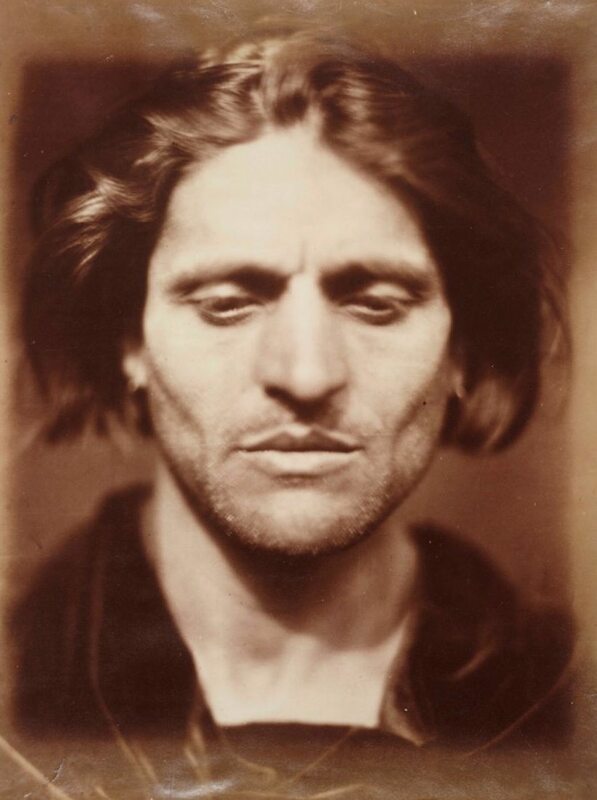 Julia Margaret Cameron: Influence and Intimacy at the Science Museum is really the story of two men and their importance in the story of the photographer. Well, maybe three if you count Iago, the posterboy and a unique selling point of the exhibition as the National Photography Collection at the Science Museum Group is the only place you'll find him. I remember seeing the photograph in person for the first time at the National Portrait Gallery's 2003 exhibition and I couldn't believe how modern he looked and the shock is still the same years later. I named a character in my latest book after him (the image is also known as 'Angelo') because those cheekbones alone are worth a trip to London. Moving on. After the voluptuous red of the V&A's gallery, the stark white Virgin Media gallery is a shock, but a no less beautiful space for display. 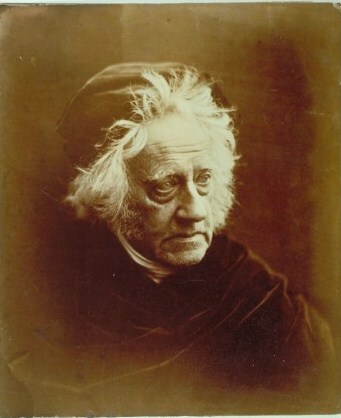 The heart of the exhibition is the Herschel Album, a collection of 94 images presented by the photographer to her mentor and friend Sir John Herschel in 1864-1867. 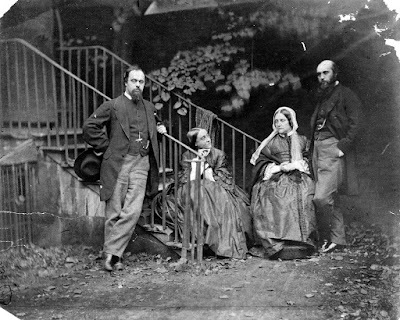 The Herschel Album contains many of the most famous images of her friends and muses (often the same thing), including Alfred, Lord Tennyson, George Frederick Watts, Thomas Carlyle and her maids, Mary Hillier, Mary Ryan and Mary Kellaway, together with the local children and other visitors. Although when seen in quick succession, the V&A and the Science Museum contain many of the same photographs, each image contains infinite tiny changes, slight pose differences, lighting changes and process differences to make them seem completely different collections. You are also looking at a collection picked by Cameron for the man who inspired and influenced her. When she put this collection together this was the pinnacle of her art as she saw it. Together with the collection are some personal items, including this early daguerreotype of Cameron and her daughter, tiny in its own precious case, possibly taken before the family came to England. 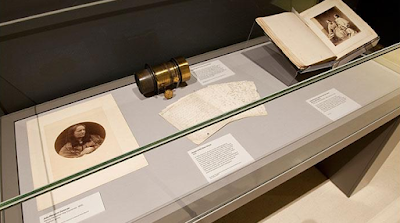 Also on show are her lens, massive in scale, and her handwritten autobiography that became Annals of My Glass House (which you can download free here). There is a wall of the precious few Sri Lankan pictures we have, infused with shade and hot light, and the artist's unquenchable fascination for the human face and its infinite varieties. It's interesting to compare the gaze of the young girl in the centre of the group of Kalutara peasants with the equally challenging stare of Julia Jackson. 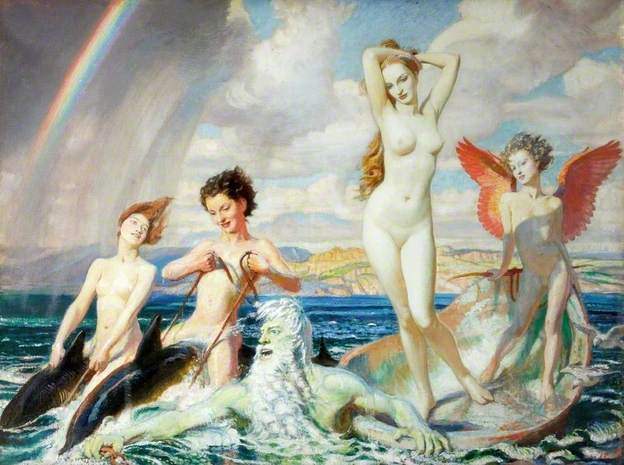 Both have the confidence of beauty and Cameron sees both as works of timeless art. I said this was the story of two men and the other is of course Colin Ford. It was through Colin's hard work that the album was saved for the nation in 1975. It was the first photographic item to be placed under an export ban and proved a landmark in classifying photography as art, which is in agreement with Julia Margaret Cameron's own aspiration and opinion of her photographs. Anyone who studies Julia Margaret Cameron's work will know Colin's massive contribution to our understanding and appreciation of the woman and her art. His books are essential reading and his role in saving the album is arguably the catalyst that has brought us to the point where we stand a good chance of getting Cameron on the back of a bank note. Neither exhibition in South Kensington is a simple delight in Cameron's work although both can be taken as just that. Just as the V&A told the story of the relationship between an unconventional artist and a national museum, this is the story of how and why we love Julia Margaret Cameron in 2015. If Colin Ford had not saved the Herschel Album in 1975, who knows if we would see Cameron as the national treaure, the trailblazer and pioneer she patently is. Dimbola Lodge might not have been saved and another female artist might have been less accessible to us, in so many ways. This is an important exhibition to remind us that art is about love and appreciation, for beauty and those who create it. 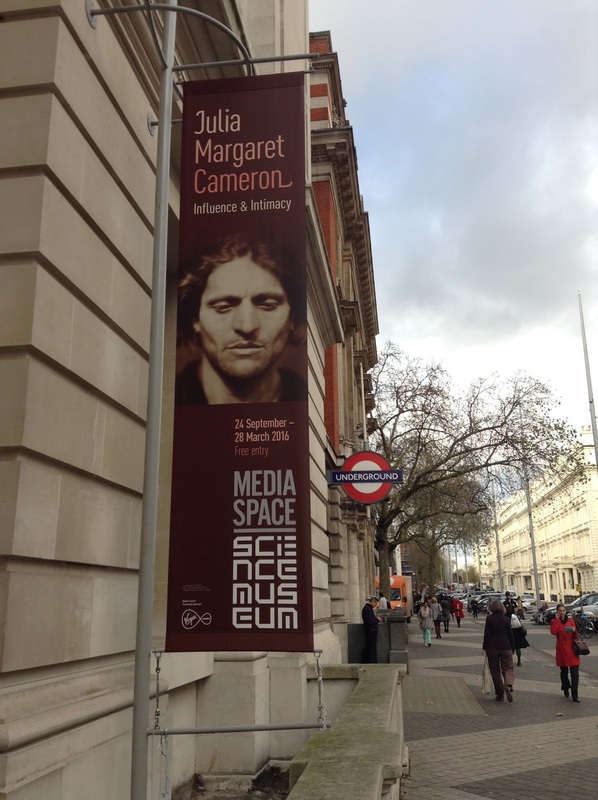 As you might have noticed, 2015 marks the bicentenary of the birth of Julia Margaret Cameron (1815-1879), but it also marks 150 years since Cameron's first and only (at least in her lifetime) museum exhibition of her works. This exhibition in 1865 was held at the South Kensington Museum (the previous name of the Victoria and Albert) under the watch of Henry Cole, the founding director. This new exhibition is not just a celebration of Cameron's extraordinary vision and talent, but also her unique relationship with Cole and the museum. 150 years after that first exhibition the V&A have drawn together a selection of Cameron's work from their collection, including prints bought directly from the artist. 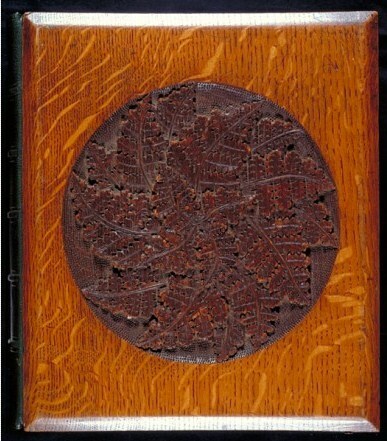 These are split into sections delineated by Cameron herself into 'Portraits', 'Madonna Groups' and 'Fancy Subjects for Pictorial Effect', each section accompanied by a letter from Cameron to Henry Cole or from Coles' diary. The pictures are grouped with great thought and tell the story of Cameron's burgeoning talent, ambition, and growing business sense and confidence. Starting with her possible collaborations with Oscar Rejlander, the exhibition extends Cameron's photographic career beyond the traditional boundary of the famous birthday present camera. 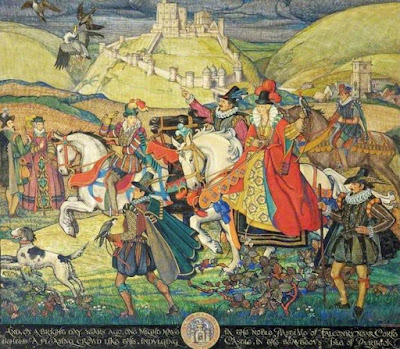 What the exhibition highlights is Cameron's unique ability to form strong and equal relationships with the men in her life. 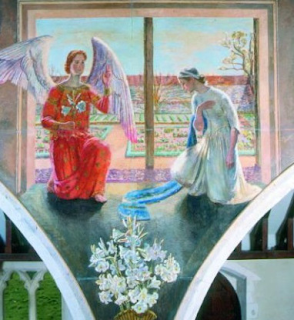 From Henry Taylor who adorns many of her images, Rejlander and Alfred, Lord Tennyson, friends and collaborators, to Cole and the V&A who allowed her space in the museum to be an artist in residence. There is a whole section on Cameron's 'mistakes' - pictures with cracks, swirls, smears and general signs of the process and the perils of the work. 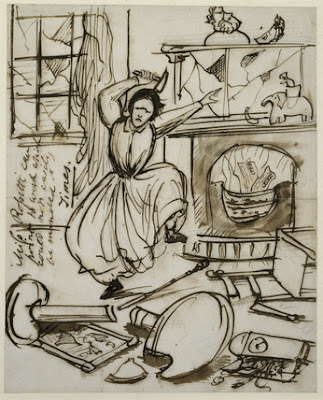 The Dream for example has two blackened finger smears on the lower right side and Mary Hillier's headscarf shows a pattern of crackling in the glaze. These flaws, when seen together, show an experimental, bold approach to the work, the sign of a woman who did not let anything limit her vision or exploration of her art. 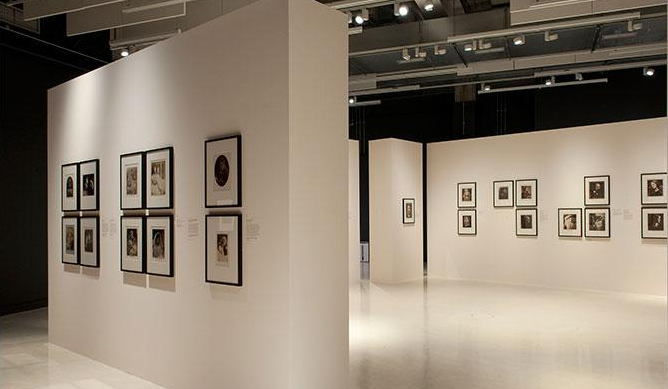 The exhibition is a fitting and full tribute to a woman who pushed the boundaries of what was expected and what was perceived as possible and suitable, in both her professional life and her art. The exhibition is free entry and runs from 28th November 2015 to the 21 February 2016. Further information on the exhibition can be found on the V&A website here. A catalogue is available to accompany the exhibition, which I reviewed here. I wanted something that summed up the bravado and utter unstoppable force of Brough Fawley. Setting the book in the 1860s and 1890s offered the posibility of photography, still quite a young art form in 1860 but one an arrogant young man would fit into, especially one who liked to capture and collect people (in every sense of the word). The idea of photography, notions of development of image, positives and negatives, all come into play in the relationship between Brough and Max. In a way I wanted Max and Brough to reflect each other in their professions - both have the ability to make something beautiful seem to appear from nowhere through their craft. I went to Dimbola Lodge to do wet plate photography for myself, to experience the smell, the feel of the glass plates in your hands, the rhythm of pouring, drying, timing your efforts under the command of the piece of glass covered in silvered egg. It is like magic and recalled many happy hours I spent as a child in my father's dark room. I can see the attraction of being able to arrest the beauty in the world onto a piece of card and call it your own. 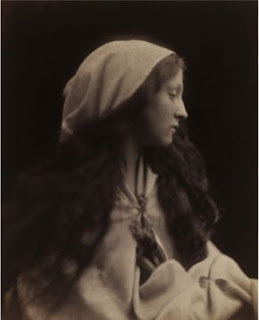 Julia Margaret Cameron said that she wanted her photographs to 'electrify you with delight and startle the world' and I could not agree more. There are themes of unrequited love in We Are Villains All and the song that tempts Max down to breakfast one morning plays to this one. A favourite of George III, this Georgian ballad was extremely popular at the time and ever since, alledgedly bringing us the phrase 'a rose without a thorn' to describe a perfect woman. 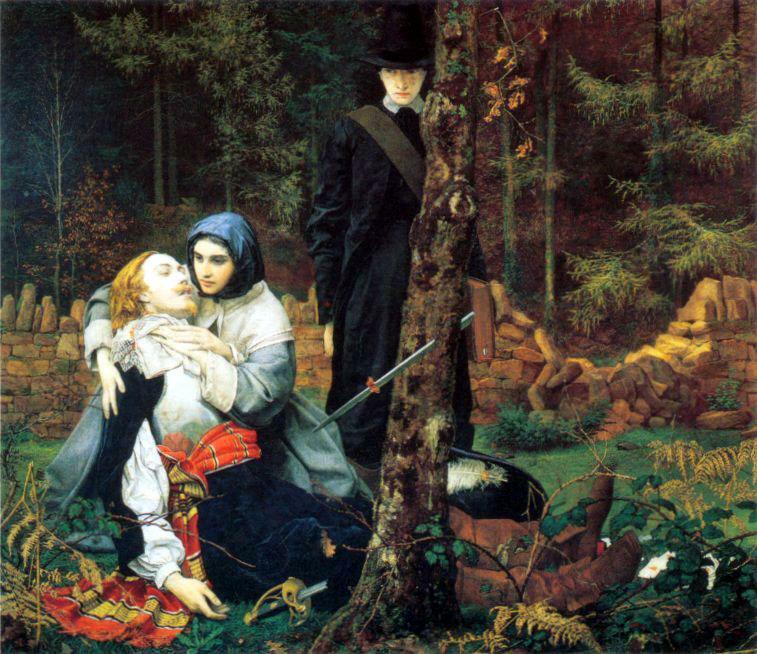 I remember standing in front of The Wounded Cavalier at the Tate's 2012 exhibition of Pre-Raphaelite art and falling in love. 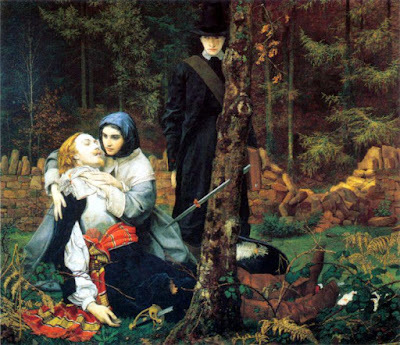 I knew it well, it is a famous painting, but seeing it in the flesh you saw how coppery the cavalier's hair is, how beautiful he is and how tragic the whole scene appears. We assume he is dying but the title just alludes to him being wounded. The man at the back definitely wants him to die and be quick about it as it is obvious that the young lady cradling the flame-haired beauty is being less than Puritan about it all. The tiny butterfly on the sword is just so exquisite, and the fact that the sword is snapped means that I don't really fancy his chances. Masks in general tell you something is hidden, someone is hiding from you. 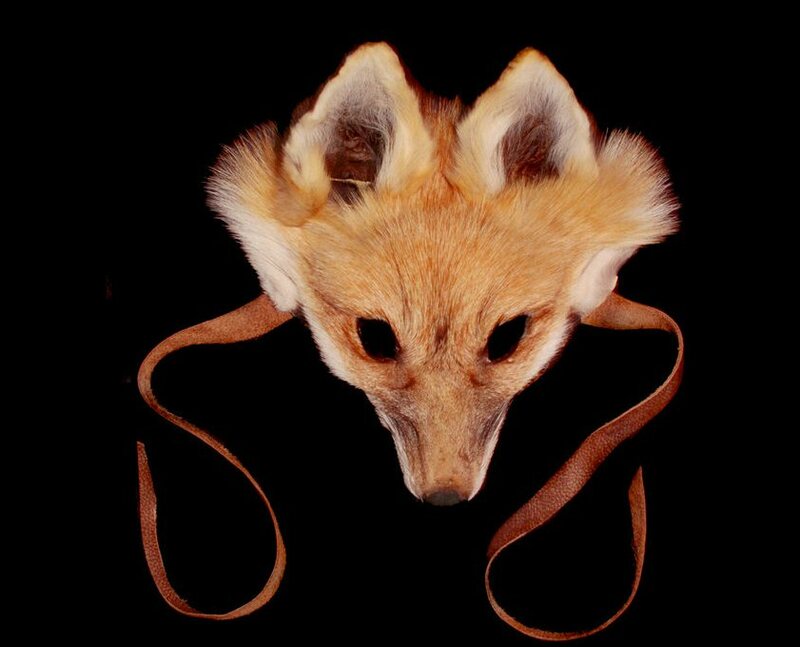 For someone to ask you to don a mask means they wish for you to assume a different guise, a different purpose. The fox in the context of We Are Villains All is the antithesis of everything Max Wainwright wants in his life; he wants stability and peace, to remain at a chaste distance from the women in his life. The Fox wants quite a different thing indeed. We Are Villains All is available now from Amazon UK (here) and USA (here) and from random and splendid book retailers everywhere. The gallery has managed to bring together a collection of paintings that feature animals, each one a gem of animal portraiture. They range from mighty lions to garden birds and also includes some striking pieces of sculpture, lent by a private collector. 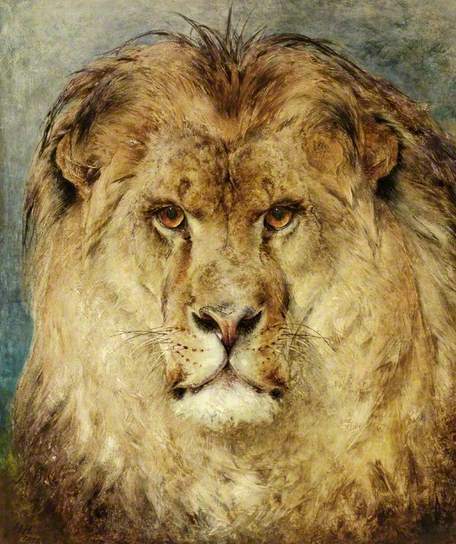 Posterboy of the exhibition is Heywood Hardy's impressive lion who stares at you as you approach the exhibition. He is at once both beautiful and a little terrifying, which is not a bad mindset to take into the exhibition as a whole. This is not a collection of little girls cuddling puppies (although there is one of those); on the contrary this is nature red in tooth and claw. The tragically beautiful Birds and Hare is a good example of this, the injured hare viewing the gathering crows who are eyeing him hungrily. One of the artists I took away from the exhibition is Charles Walter Simpson, responsible for the all-American painting above that was actually painted at the First International Rodeo or Cowboy Championships at Wembley Stadium. Who knew such a thing existed? Well, in this country it did not exist for very long as Parliament passed a law in 1934 making it illegal to rope an untrained animal. 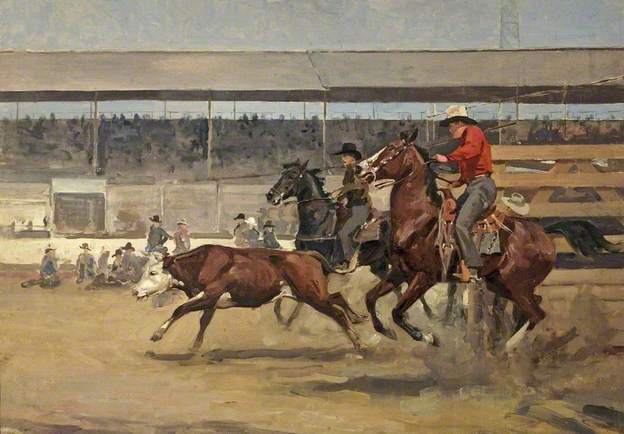 Still, for a mad moment in the roaring 20s, the wild West came to London and Simpson caught the energy on canvas. Another of Simpson's works, The Punt Gunner, is striking because of its sheer size. 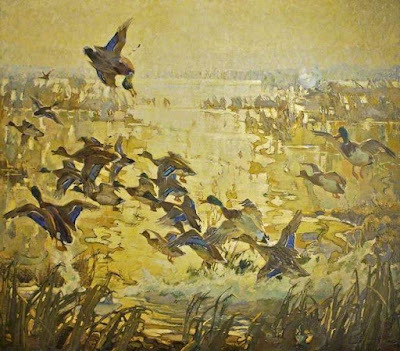 At practically two metres square, the ducks in flight are almost abstract in their beauty. 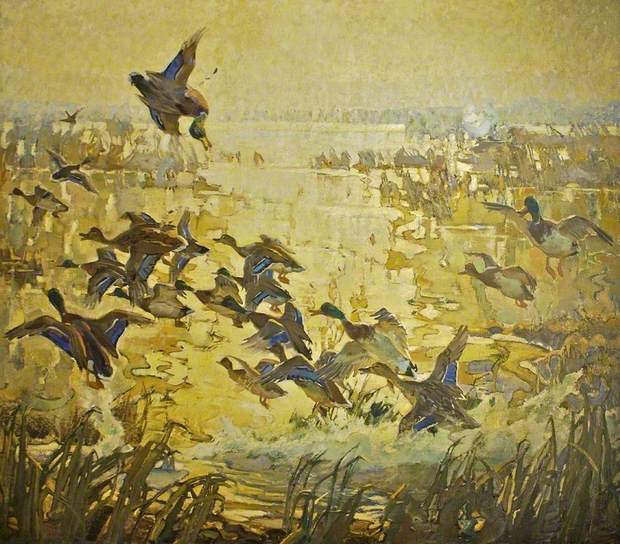 It is like a golden piece of Japanese painting with the morning sun shimmering off the water. Along with images of animals in their natural habitats, there are also interesting pictures of animals, anthropomorphised or depicting human emotions. The Beggar shows the shamed mongrel being looked down on by the haughty pug. I do like a haughty pug. 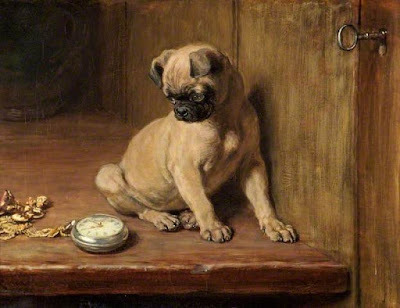 Talking of pugs, here is a confused one, looking at a ticking pocket watch. Riviere produced some of the most sentimental yet interesting animal pictures of the nineteenth century and declared 'You can never paint a dog unless you are fond of it', which I think is a lovely notion. The great thing about this exhibition is that animals, like people, are endlessly interesting and marvellously accessible. From lions to robins, all these paintings and the wonderful deco sculptures give life and story to the animals. Often that story touches on our involvement with our animal neighbours, our response to the wild and exotic or the familiar and domestic. 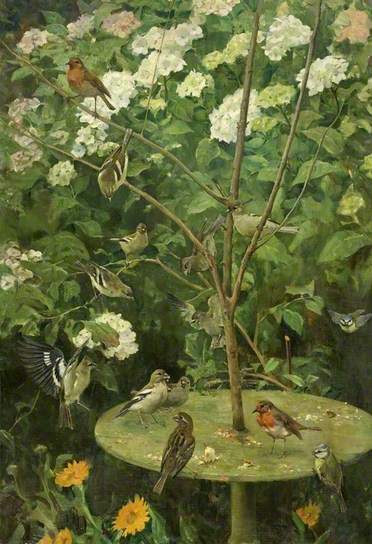 The Victorians did a great line in anthropomorphising animals, letting them express human emotions for us but mostly on show here is how animals are appreciated in art from around 1850 to 1950. Each of these pictures is a gem and the whole exhibition is a great idea, simple and something you can respond to. 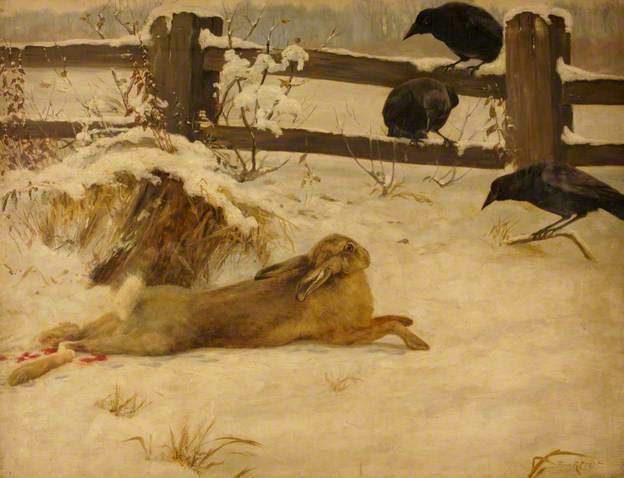 A great family exhibition, and something for all animal lovers this Winter. Beasts or Best Friends: Animals in Art is on until March 2016 and look here for more information. 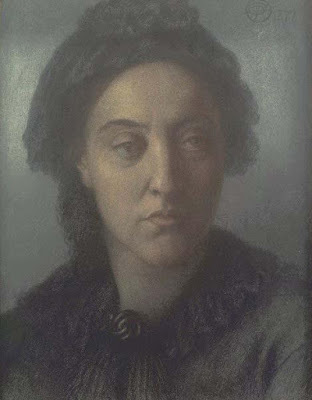 When Christina Rossetti died in 1894, she was survived only by her brother William Michael. 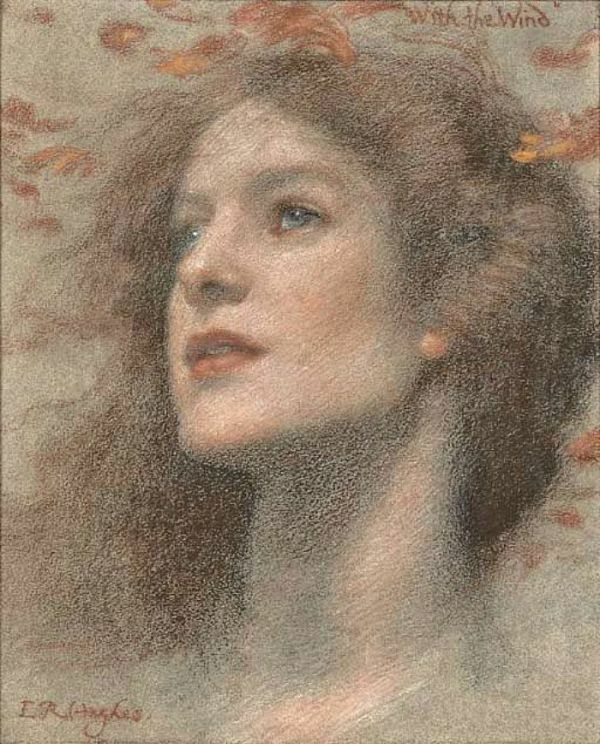 Her obituaries drew notice to her gifts as a writer, the strange Rossetti genius and her ability to combine her religious conviction with exceptional literary powers. She was likened to Blake in her poetry, a rare poet who can bring Christianity to life in verse, and it was bemoaned that she was no offered the Laureateship. 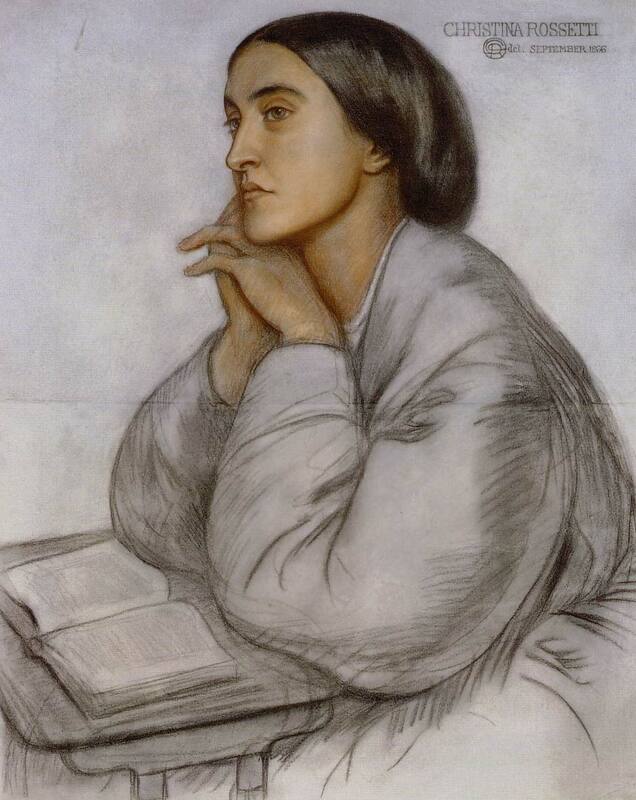 Although, as the Pall Mall Gazette insisted, there were few women who distinguished themselves in poetry, Christina Rossetti 'so easily o'ertopped the rest'. 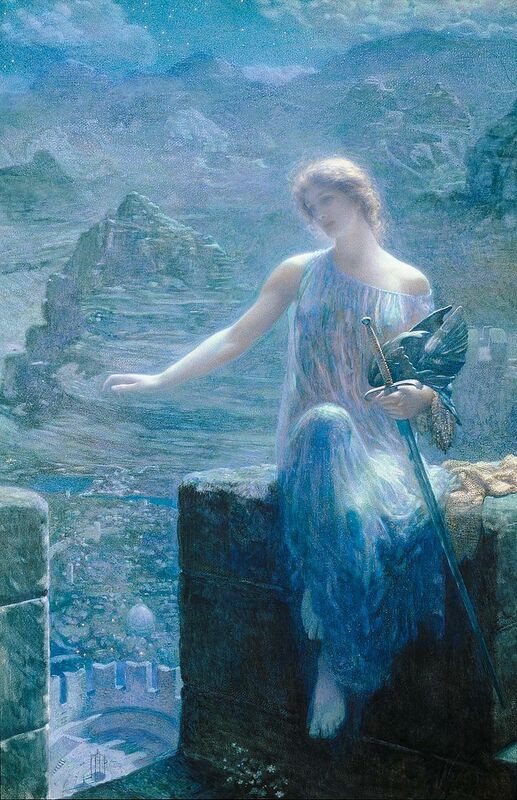 She was exceptional at the time of her first collection of poetry, when she was just 16, and despite ill-health, she remained brilliant to the end. Her funeral was described in detail in the new year papers in 1895. The church in Woburn Square was full of mourners, and the lady herself was encased in an elm coffin with an oak cross atop it. The base of the cross held a plaque with her details. Chief among her mourners was her brother and his family. I have to admit a sly humour at the descriptions of the Rossetti family, how the press talked of the artistic genius of Dante Gabriel, the literary prowess of Christina, the amazing devotion of Maria, and William, who was still alive. Her Will amounted to £13,000 which primarily went to William apart from some small bequests to other family members. The Western Daily Press of 16 February 1895 describes how the 'testatrix' left William her books, furniture, plate and household effects in gratitude for his giving her a home in the past. William went on to posthumously publish her final volume of poetry and Mackenzie Bell published a mediocre biography of Christina within a year or so of her death. The Dundee Advertiser of January 1898 easily puts its finger on the problem with Christina Rossetti's posthumous modern reputation - all we know of her is her poetry, because that is all that there is. Bell struggled to write a biography because there seemed to be no moments of drama in her life that reflected in her work. We know more now but in 1898 Christina's life remained veiled and she had no rampant love affairs, nor tragedies, nor scandal. All she had was her quiet life and her poetry. In a piece in the Lancashire Evening Post of December 1930, it was stated that 'Christina Rossetti's appeal is not likely to diminish' as she lived on in popular Christmas carols, and 'Goblin Market' which seemed to be constantly performed at girl's schools in the first half of the twentieth century. The story that she managed to write at a corner of her washstand, one of the few biographical stories that endured, suddenly came to life when illuminated by Virginia Woolf's assertion that women had to have a space of their own to write, no matter how small that space was. 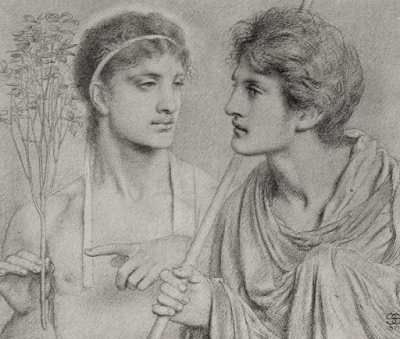 Christina, the pinnacle of single womanhood, the pioneer of female writing, had found an unlikely audience, but one who embraced her just as they began to neglect her brother. 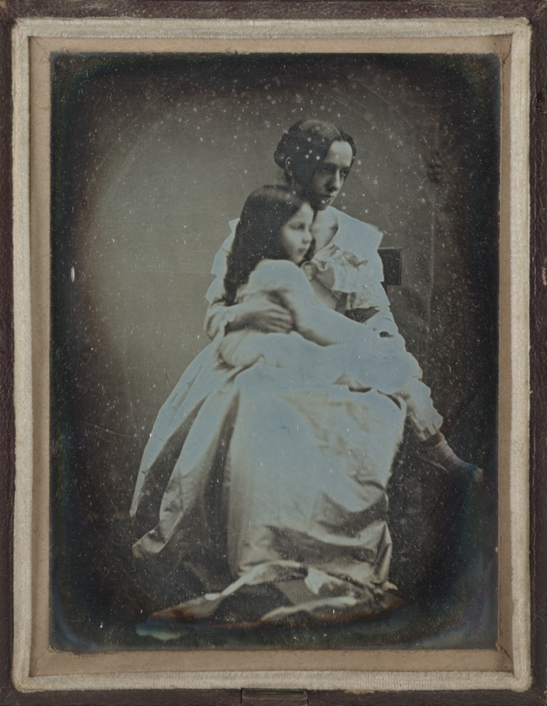 As you will probably know, I had the great pleasure of giving a paper at this summer's conference on Julia Margaret Cameron. Whilst there, wearing my Julia Stephen tshirt from Mrs Middleton's Shop, I made the friendship of the very lovely Marion Dell, author of the recently published Virginia Woolf's Influential Forebears, a brilliant book about the influence on Woolf from Julia Margaret Cameron, Anny Thackeray Ritchie and Julia Stephen, Woolf's mother. 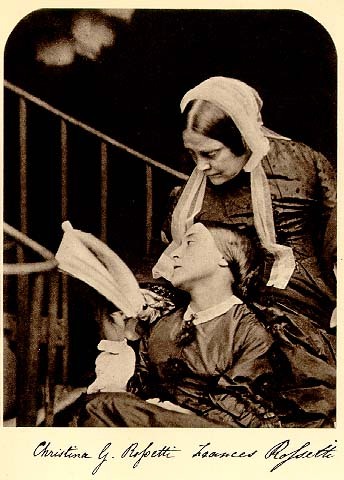 What interested me about this aspect of Julia Margaret Cameron studies is how her influence and reputation was used and abused (and ignored) by one of the foremost figures in twentieth century literary and cultural history. 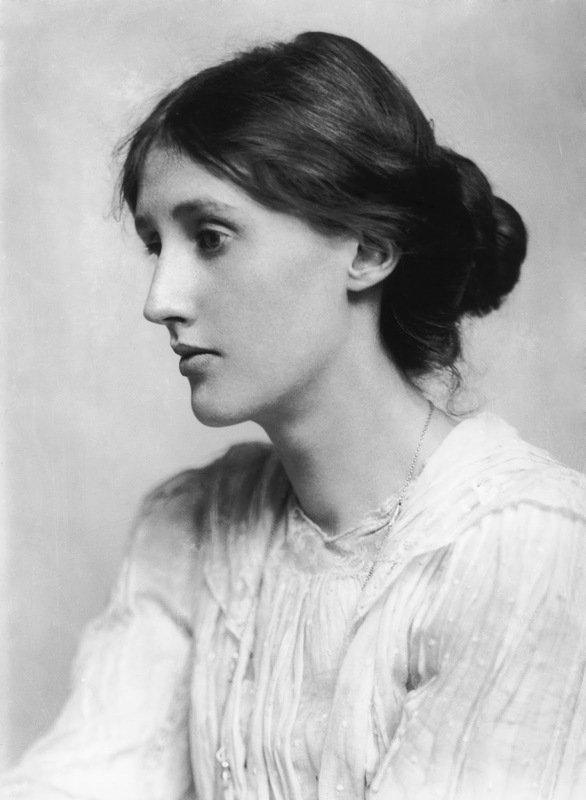 I had studied Woolf as part of my degrees, and her writing is obviously extremely perceptive and meaningful, but this was a new side to her, one which very openly revealed a struggle to come to terms with where she had come from and what the work of other women in her family meant to her. Marion's book is split into different sections examining in detail Woolf's responses to each of her female relatives and the influence they have had upon her, both acknowledged and very often unacknowledged. 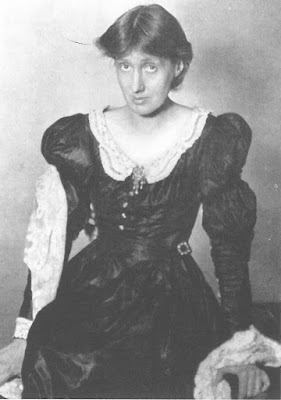 This web that seems to hang above Woolf, of clever, talented, groundbreaking women, begins to loom like a cloud rather than act as inspiration and I found the many instances of Woolf seeming to fight against the pressure of apparent expectation (of success or failure) in turns shocking, defiant, humorous and contradictory. While I had never previously warmed to Woolf, despite her obvious importance, this side of her made me far more curious about her than any number of her essays and I thank Marion for making me want to read more of Woolf's work to see if I can follow the threads further. Note motif of the red dress again. Q. Your previous book was about Virginia Woolf and Vanessa Bell, what drew you to explore Woolf's matrilineal line and the influence on her work? My interest in Virginia Woof’s family background and its influence on her work, really began one memorable holiday when I was sitting on the balcony at Talland House reading To the Lighthouse. I looked across the Bay to Godrevy Lighthouse and realised just how many of her memories of her own holiday home, of St Ives, and of her childhood summers there with her family Woolf had put into that novel and her other work. 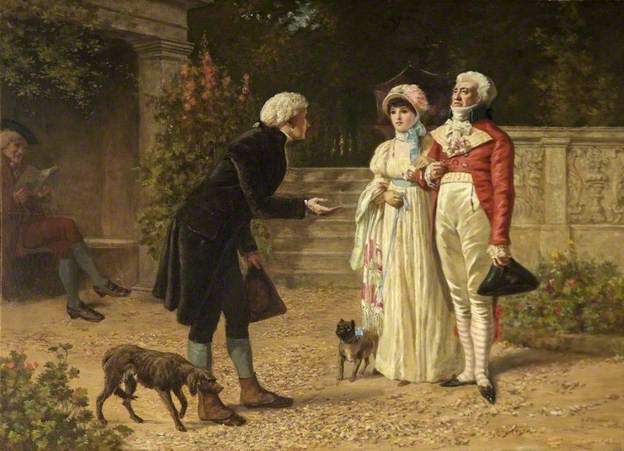 In particular I was fascinated by the mother figure, the complex and enigmatic, Mrs Ramsay. Then I read Julia Stephen’s own stories, newly retrieved and published for the first time by Diane Gillespie and Elizabeth Steele in Stories for Children. I realised that Woolf was following in her mother’s footsteps in fictionalising St Ives, Talland House and family memories of their Cornish summers. 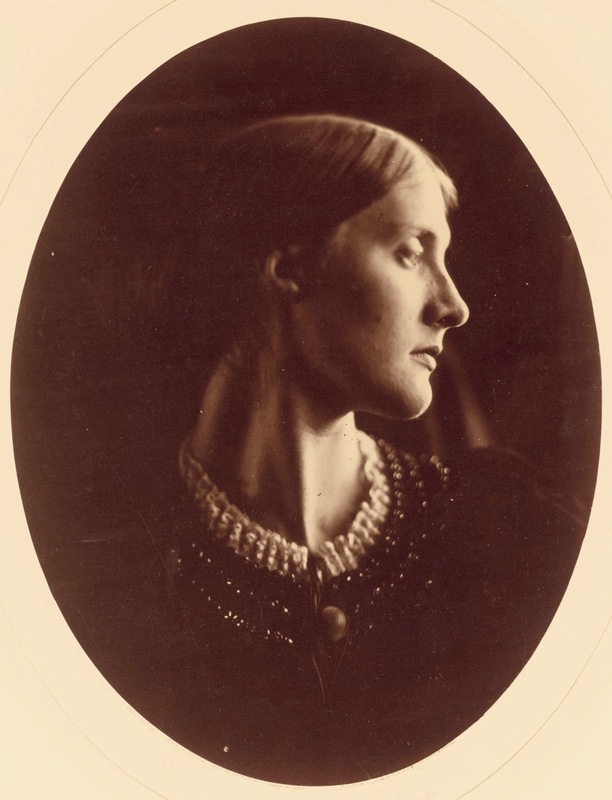 For the last ten years I have been finding out more about the elusive Julia Stephen and discovering just how much she, and other forebears, influenced Woolf’s work. My quest continues. Q. Before reading around Julia Margaret Cameron I had never heard of Anny Ritchie (and I had a decent Open University literature education!). How far do you think Woolf has influenced her disappearance from reading today? I was especially surprised by your reference to 'Flush' and Woolf not mentioning Ritchie as a source. In their day Victorian writers such as Anny Ritchie, Margaret Oliphant, Mrs Humphrey Ward, William Thackeray, Grant Allen and many others were best-selling and acclaimed. Now most have dropped off popular reading lists and the academic canon because their topics, style and sheer length are no longer fashionable. Even Dickens and the Brontës are now better known through films rather than through reading their novels. So I don’t think Ritchie’s disappearance can be attributed to Woolf. But Woolf did have many opportunities to celebrate and retrieve Ritchie’s work, and that of many other earlier writers, and she failed to do this. 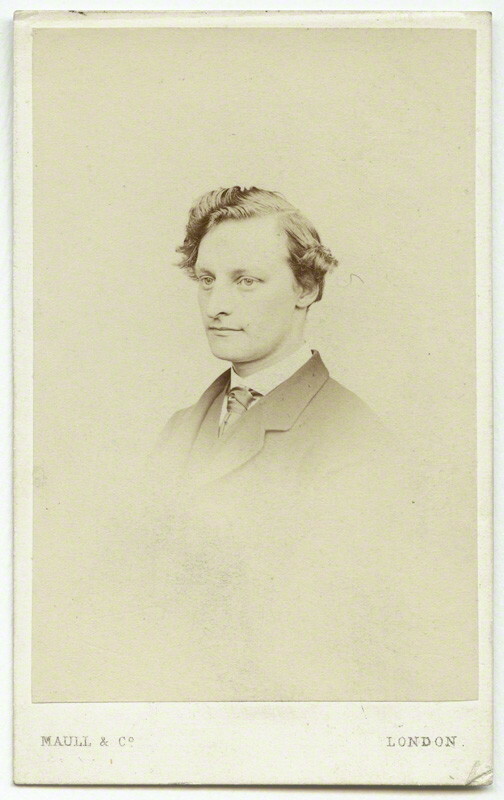 Q. Julia Margaret Cameron offered support to Ritchie after the death of her father and was rewarded by fond reminiscence. When Ritchie extended the same to Woolf, why do you think it wasn't acknowledged the same way? 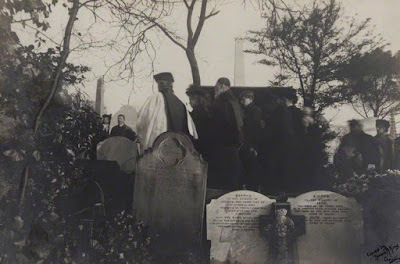 As I show in my book, Julia Margaret Cameron, Anny Thackeray Ritchie and Julia Prinsep Stephen were part of a collaborative sisterhood who supported each other in both their domestic lives and their working lives. 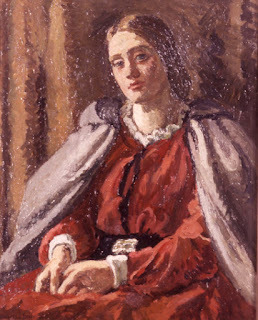 Ritchie, and other maternal figures such as Madge Vaughan, extended this support to Woolf as a young apprentice. Woolf’s obscuring of Ritchie’s influence and support was part of her obscuring of any influence from her past, as I try to explore in my final chapter. Her response to her past was ambivalent and complex. It changed through her life and was never fully resolved. Q. It feels like too big a question to ask what Woolf's problem with Cameron was, so I'll start with Julia Stephen - do you think Woolf felt jealous that Cameron had managed to capture and fix an idea of Julia that possibly her young daughter could not match or better? This is a difficult question and the answer is partly covered by my previous one. Woolf’s responses to all three women were part of her ambivalence about influences from her past in general. I have no evidence that she felt jealous of Cameron’s relationship with her mother, but I speculate that she did feel excluded. 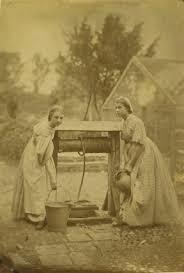 She was excluded from the Freshwater and Little Holland House Circles, of which they were so much a part. Given her age of course, this was inevitable, but such feelings are not logical. Q. Woolf literally scratches out Cameron's name from her work and replaces it with 'the photographer' who is someone to escape from. On the face of it you would think Woolf would have been proud to herald such a pioneer artist and business woman yet belittles her. What do you think is at the root or is it impossible to pin to one thing? I think this is all part of Woolf’s cycle of rejection and affiliation for her past, including all three of the forebears in this study, which I identify in my final chapter. As you say – on the face of it is incomprehensible and it is very difficult to account for. Q. The book 'Victorian Photographs of Famous Men and Fair Women' fascinates me not least because the title doesn't mention Cameron at all and it seems to imply women can only be noticed for their looks. Fry obviously admires Cameron and her work, so do you think the book is Woolf's conflict in action? Q. And finally, what are you working on next? I have two projects. 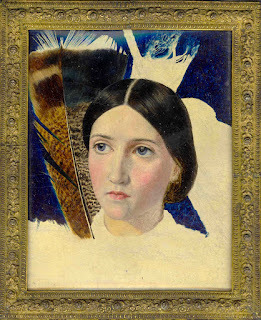 I am writing a biography of Julia Stephen which I plan to publish this coming year. 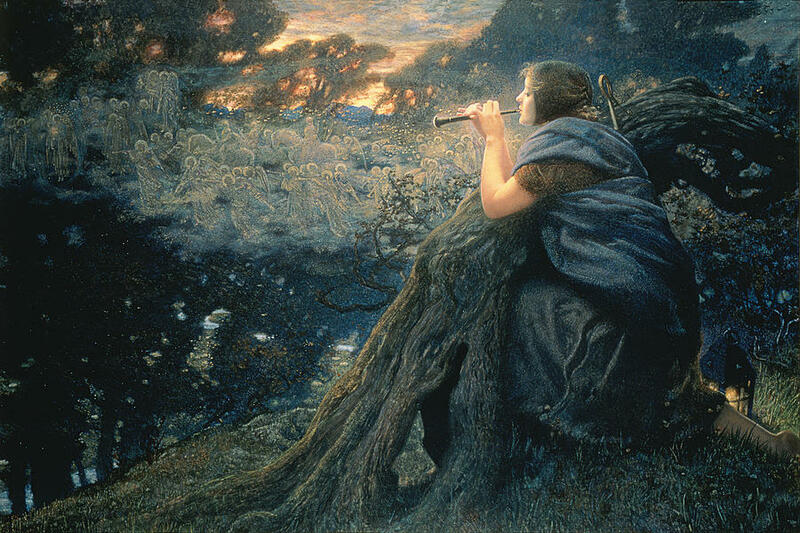 I am also researching the literary history of my own area around Haslemere and Hindhead which at the turn of the nineteenth and twentieth centuries was a flourishing, bohemian, artistic colony in a beautiful area known as The English Switzerland. Tennyson, Conan Doyle, George Eliot and many other lesser known writers lived and worked here at this time. This is for an exhibition at the Haslemere Educational Museum in April 2016 and an accompanying illustrated book. Many thanks to Marion for her time and for writing this really smashing book and I await her next book with eager anticipation (not to mention the exhibition which coincides with my birthday next year!). Virginia Wool's Influential Forebears:Julia Margaret Cameron, Anny Thackeray Ritchie and Julia Prinsep Stephen is available now from Amazon UK (here) or USA (here) or from all splendid bookshops. We Are Villains All - A Sneak Peek!